It’s the most wonderful time of the year and we are getting into the holiday spirit by giving away a gift every day until Christmas! We have made a list and checked it twice, and we are so excited to announce these awesome giveaways! We have teamed up with some amazing sponsors to bring you The 24 Days of Christmas Giveaways! 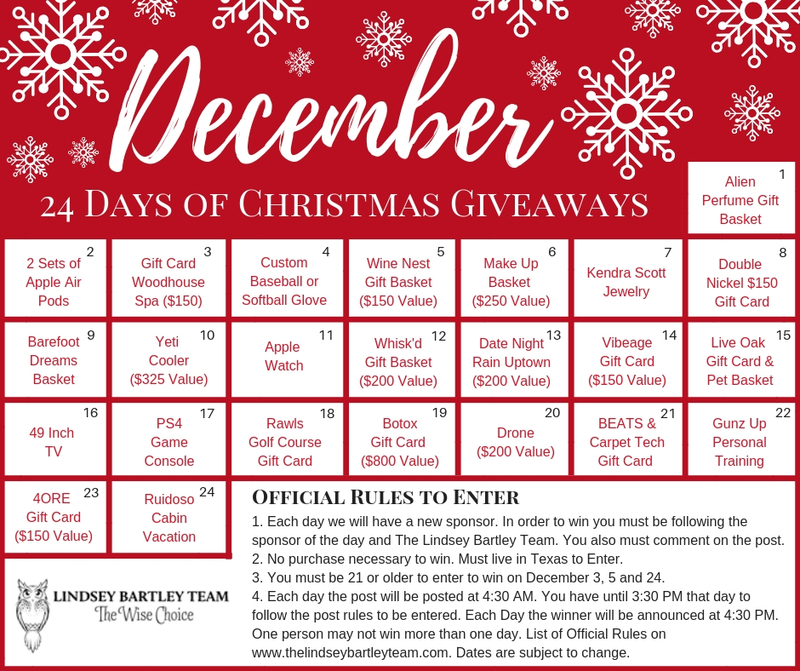 Starting on December 1st, The Lindsey Bartley Team will be giving away one gift to a different follower every day until December 24. Each day will be sponsored by a different Lubbock local business! This giveaway will be ran on Facebook and Instagram. To enter on Facebook, you must like The Lindsey Bartley Team Facebook page and the sponsor of the day Facebook Page. To enter on Instagram, you must be following our page and the sponsor of the day’s page. Everyday we will draw a random winner at 4:30 PM! No Purchase Necessary to win. Must live in Texas to enter. You must be 21 or older to enter to win on December 3, 5, and 24th. Each day the post will be posted at 4:30 PM the day before we draw a winner. You must enter on The Lindsey Bartley Team Page and follow all the rules on the daily posts. One person may not win more than one day. This promotion is in no way sponsored, endorsed or administered by or associated with Facebook or Instagram. December 1 – Alien Perfume Basket ($150 Value). Sponsored by Grease Monkey and Monkey Splash. December 2 – 2 Pairs of Apple Air Pods. Sponsored by Earl’s Plumbing and Home Warranty. December 3 – Woodhouse Spa Gift Card ($150 Value). Sponsored by Doug Davis Inspector Services. December 4 – Customized Baseball/Softball Glove. Sponsored by Bobby Livingston Baseball. December 5 – $150 Wine Nest Gift Card and $150 Wine Nest Gift Basket. Sponsored by The Wine Nest and Kathy Davis at Fidelity National Home Warranty. December 6 – Make Up Beauty Basket ($250 Value). Sponsored by ProTech Painting. December 7 – Kendra Scott Jewelry. Sponsored by J. Hoffmans. December 8 – Double Nickel Gift Card ($150 Value). Sponsored by Team Phebe. December 9 – Barefoot Dreams Basket – includes Barefoot dream blanket, volcano candle, hot chocolate and a $25 Barnes and Nobles Gift Card. Sponsored by Amy Riggan from Texas Farm Bureau Insurance. December 10 – Yeti Hopper Cooler. Sponsored by Hart Moving Company. December 11 – Apple Watch. Sponsored by Ashley Laycock at TTFCU. December 12 – Whisk’d Gift Basket ($200 Value). Sponsored by Whisk’d. December 13 – Date Night at Rain Uptown ($200 Value). Sponsored by Rain Uptown. December 14 – Vibeage Gift Card ($150 Value). Sponsored by Vibeage Boutique. December 15 – Live Oak Gift Card and Three Dog Bakery Gift Basket. Sponsored by Live Oak Animal Hospital and Three Dog Bakery. December 16 – 49 Inch TV. Sponsored by Rustic Outdoor Escapes. December 17 – PS4 Game Console. Sponsored by Plains Roofing. December 18 – Rawls Golf Course Gift Card. Sponsored by Rawls Golf Course. December 19 – $800 Botox Gift Card. Sponsored by Aesthetic Center of Lubbock. December 20 – Drone ($200 Value). Sponsored by Weston Taylor. December 21 – A pair of Beats and Carpet Tech Gift Card. Sponsored by Carpet Tech. December 22 – 5 Personal Training Sessions. Sponsored by Gunz Up Fitness. December 23 – 4ORE Gift Card ($150 Value). Sponsored by 4ORE. Dates are subject to change. Must live in Texas to enter. You must be 21 or older to enter to win on December 3,5, and 24th. Void where prohibited. No Purchase Necessary to win. One person may not win more than one day. This promotion is in no way sponsored, endorsed or administered by or associated with Facebook or Instagram.You Must be following The Lindsey Bartley Team and the daily sponsor to win the daily prize. Each post will go out daily at 4:30 AM. You have until 3:30 to enter. A winner will be picked at random everyday at 4:30 PM.